The following can be adapted according to the physiotherapist’s requirements, typed out, duplicated and handed to patients as reminders of what they should and should not do to avoid a recurrence of the problem. 1. Side-laying head support, with the top leg supported. 3. Supine, with one pillow under the knees. 4. For patients who are used to lying prone, teach a three-quarter prone position – pad with pillows. Sensible shoes – point out the distortion, produced by high heels. Emphasize that if the pelvis is correct then the rest of the posture will fall into place, therefore, make certain that the ‘stomach’ muscles are pressed toward the spine, and the ‘bottom’ is tucked in. 1. 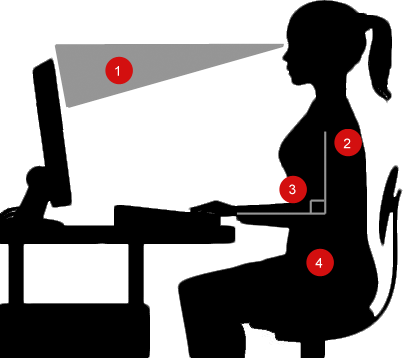 If sitting irritates – ration the time spent sitting, get up before the pain comes on. 2, Have a firm chair with no wheels on it (i.e. avoid unexpected jarring of the back). 3. Hips should be well back, feet firmly on the ground with support at the small of the back. 4. Pick a chair which fits your size. 5. If you feel comfortable, it means, that it is mechanically right. 6. Show the patient a picture of the correct sitting position. 1. Use of arms to take the weight of the upper trunk off the lumbar spine. 2. Use of walking on hips to reach the edge of the chair, i.e. keeping the back extended, thus enabling the patient to get up without flexing the lumbar spine. 3. Place one foot at the side of the chair to help getting up from sitting to standing. 1. Never lift a child from sitting, always crouch down keeping the lower back straight. 2. For standing jobs: (a) have the weight evenly on both legs (b) teach a lordotic patient the value of placing one foot on a low stool. 3. Making beds: (a) kneel at the side of the bed, smooth one half of a double bed, then repeat for the other side or (b) place one knee on the bed and repeat (a) Never stretch across the bed with straight knees. 4. Cleaning the bath: Kneel at the side (use this position for washing hair if no overhead shower present). 5. Never walk up or down stairs in floppy shoes (tripping could cause a sudden stress on the back.). 6. Cooking: work surfaces should fit your height. Discuss adaptations. 7. Keep heavy utensils on waist height shelves. 8. Keep light objects on lower shelves. 9. Shopping: use a trolley or take husband! If carrying bags, distribute weight evenly within capacity. 10. Hanging washing; use a stool if arching the back increases pain. 11. Remember the danger of slipping on wet floors, particularly kitchen/bathroom. 12. Hovering: use two hands to spare your back. 13. Clean up spilled water or fat from the floor to avoid and danger of sudden slipping. 1. Have the chair well up to the desk. 2. Support the small of the back. 3. Have no wheels on the chair. 1. Always place one foot flat and at the side of the object to be lifted. 2. Never lift with your body-weight on the balls of your feet as it flexes the small of the back. 3. Always tuck the weight to be lifted into your stomach. 4. Lift within your capacity. 5. Have feet pointing in the direction you will be walking. 6. Use ‘feet’ to turn when taking the weight from one surface to another. 7. When there is two-woman lifting see that one is in command, take a firm grasp and lift to a count. 2. Hips into the car first then feet in. 3. Pelvic tilting as you drive (i.e. from time to time). 4. Break up long journeys by stopping before you have tired of one position. 5. Young females on motor cycles or bicycles should check the position of the handlebars re: the position of the small of the back. 1. Kneel at the side of the bath to wash hair/face. 2. Never use long sitting in the bath. 3. Use a non-slip mat. 1. Slacks easier than tights for an acute back. 2. Shoes should be well supporting. 4. Soft heels on shoes rather than leather heels. By keeping these tips in your mind and incorporating them into your daily lifestyle , will help you to prevent vertebral pain . Become conscious of your movement and work style , for many a times the problem can be overcome by correction of posture and performing various daily activities in the correct way. Women at 40 Vertebral Fracture or Lean Body Mass: A Matter of Your Choice!